“Olivia” as a name was at one time banned in Spain. Or so the story goes. Some versions attribute this to a feud between General Francisco Franco and the actress Olivia de Havilland of “Gone With The Wind” fame. He hated her and her politics. 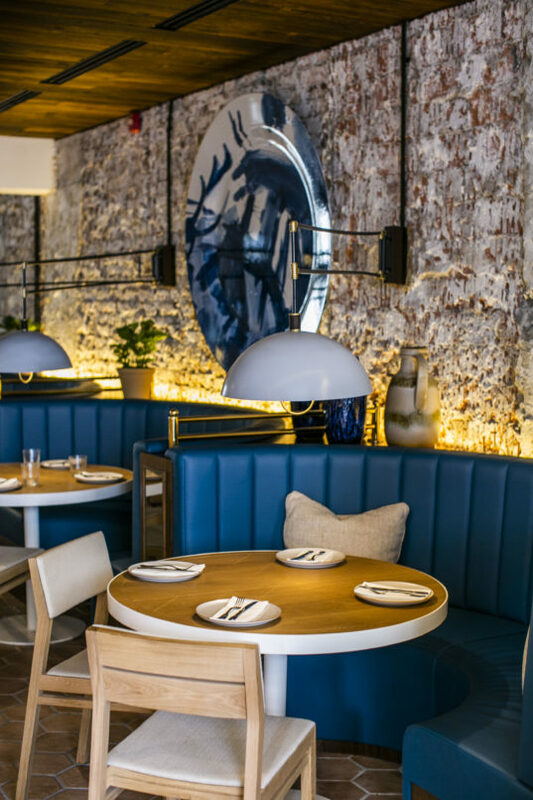 This bit of trivia is relevant as it stands in stark, glowing contrast to the newest addition to Keong Saik Road’s buzzing dining enclave: Olivia Restaurant & Lounge. This Olivia is named for Chef Alain Devahive’s daughter, a name that stands for “peace” and “fraternity.” Chef Alain has spent over a decade in the kitchens of Michelin-starred restaurants around the world – including the legendary El Bulli. 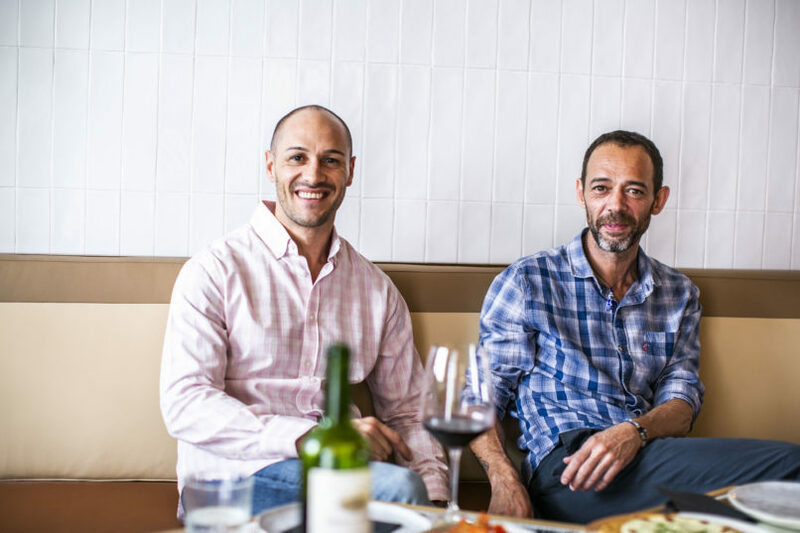 He is himself from the Catalan region of Spain and combines the region’s family culture – one where values are centred around sharing a meal – with a dining scene heightened by international sensibilities. In other words, whereas “Olivia” at one point was a source of conflict and exclusion, Olivia the restaurant is the complete opposite. It is a symbol of love, for home and family, for diversity and inclusion, and most delicious of all, for food. And particularly in these challenging times, love – not to mention a fantastic restaurant – is exactly what all of us need. To walk into Olivia is to be transported far away from our sweltering urban centre and into a bright, open home along the Mediterranean coast. This dynamic atmosphere has been carefully curated by Barcelona-based design firm Lázaro Rosa-Violán. Everyone will feel welcome. Seating areas have been so thoughtfully arranged that groups of all types and sizes are afforded privacy. During the day, the sunlight bounces off white lamps and white-flecked, exposed-brick walls to give the illusion of clouds floating over the sea. 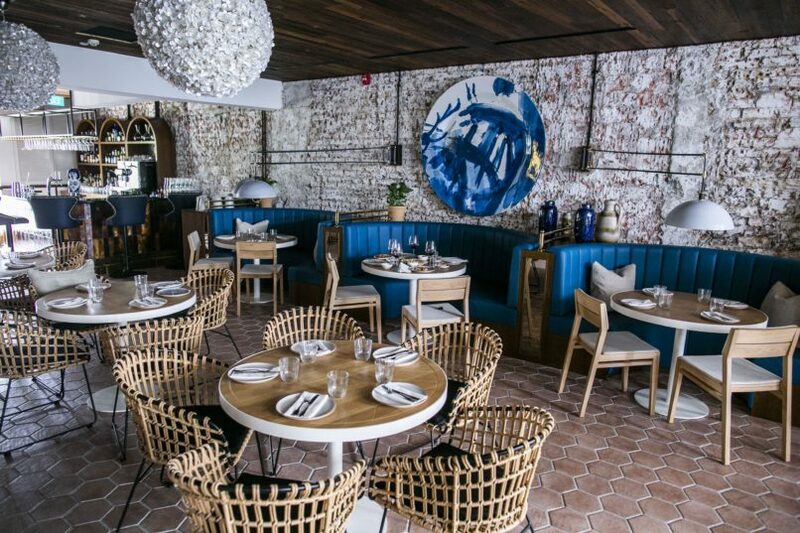 Curved booths covered in blue leather stand-in for crystal-clear water, and mud-coloured tiles, imported from Barcelona, evoke the floor of a veranda overlooking the beach. At night, those same white lamps glow with golden light, and the restaurant becomes an intimate retreat, where friends breaking bread or a family sharing a late-night meal are just as likely to gather as lovers escaping into each other’s gaze. No matter the time of day though, the open kitchen stands front and centre, lit brilliantly from overhead and staffed with cooks fashionably adorned in smoke grey uniforms. There is quiet, ordered chaos to their choreographed meal preparations. The menu is a collection of tapas and shared plates of varying sizes and is divided into four sections. You will be hard pressed to find a single bad dish amongst them. 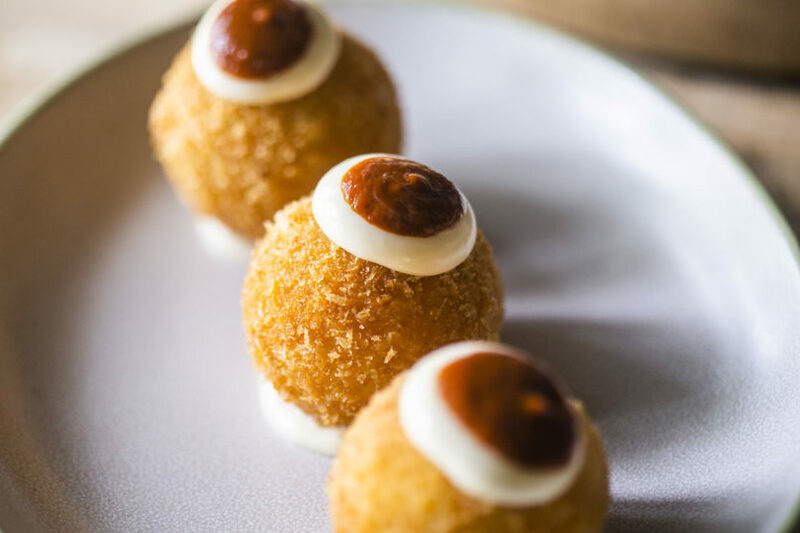 It is “Olivia,” after all, so it is hard to resist the visual pun appeal offered by a dish named “spherical olive,” Chef Alain’s homage to El Bulli where this bite was first created. It has not lost any of its molecular gastronomy magic; its smooth liquid coats the palate and then dissipates into olive essence. Next, try the punchy Jamón Ibérico de bellota – ham from pigs fed with acorns that is pink and aromatic, each stiff slice like a roof shingle, or a swatch of fabric from a meaty blanket. Finally, ask for a plate of the “bombas,” explosively flavoured croquettes stuffed with minced beef and pork, mashed potatoes, and topped with aioli and a spicy red sauce. There are many similar types floating around Singapore at the moment, but we dare say this is the definitive version. The transition to slightly bigger plates should begin with the canelón, a take on stuffed pasta. One version is vegetarian, filled with spinach and cheese, and a surprising pop of sweet raisins. The other is chock full of braised beef cheek and coated in a heart-stopping parmesan cream. It would be too rich if not for the addition of a potent tincture of basil oil that brings a stunning balance to the plate. Ask for shaved black truffles to go on top – or don’t. Either way, this dish is a revelation. Better still is the Spanish omelette that comes stuffed with confit onion and codfish that is dried and salted in Scandinavia. The white sauce on top is the star, made from codfish skin and garlic oil. Do not leave without trying the beef carpaccio; it is not only the best dish at Olivia, but is one of the best dishes being served anywhere in Singapore at the moment. You would be forgiven for thinking at first glance that the swirls inside the thin beef slices are fat, but they are actually foie gras. Achieving this must be a technical feat but we prefer instead to attribute some things to magic, which, when finished with truffle sauce and sparkling specks of confited orange skin, is exactly what this rich, gorgeous dish is. The mains here are best enjoyed with a group and are sometimes an afterthought given everything stellar that came before. Among the half dozen or so choices, go straight for the Japanese tuna cheeks. This dish has the potential to be divisive, as it announces itself with a wallop of ocean aroma long before it arrives. But, oh, how those fatty tuna cheeks just quiver under a blended sauce made from tuna bones and red peppers, and then spritzed with olive water. It was exhilarating. 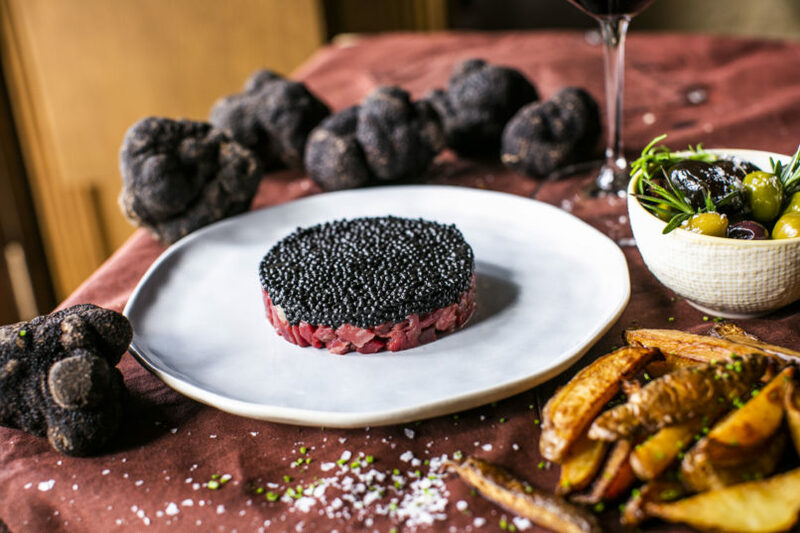 Steak tartare is visually stunning, topped with a thick layer of Avruga caviar, the roe substitute that tastes and looks just like the real thing, if not exactly having the same texture. It is also impossible to eat with the thin French fries served on the side, so skip those and just grab a fork. If after all of this, you still have room for dessert, then you are spoiled for choice. “Warm chocolate foam” is an otherwise boring name for a dessert that is reminiscent of a Cadbury fruit & nut chocolate bar, and there are so many sweet, crunchy bits and pieces hiding underneath that half the fun of eating this dish is digging around to find buried treasure. You will, however, want to save room for the cheesecake, which appears to have a scientific explanation to how wonderful it is. It involves an exact combination of eggs, flour, sugar, and several different cheeses (they won’t tell you which ones, so don’t bother asking), all cooked at 180 degrees for the precisely perfect amount of time. But when it comes to the table, its sweet, gooey center oozing out onto the plate, it’s better explained by witchcraft, or better yet, gobbled up with no words exchanged at all. 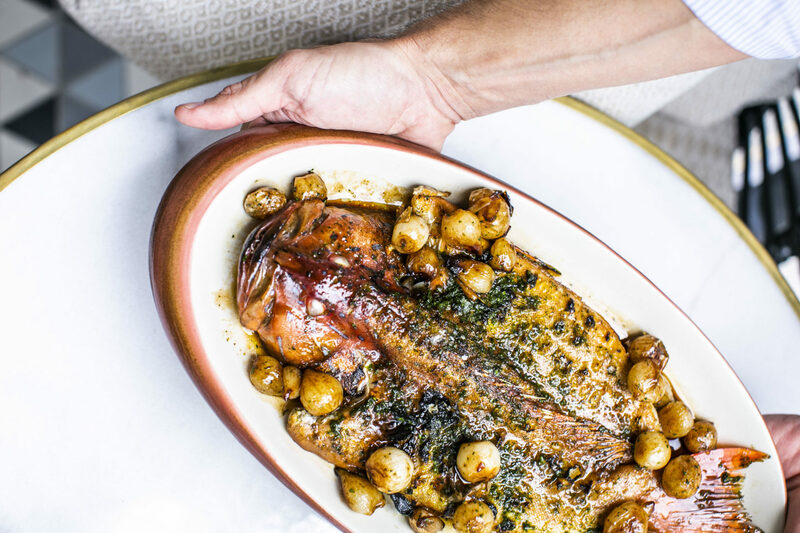 Olivia is a wonderful restaurant and will easily be one of 2019’s best new openings. We have rarely seen or tasted food “The Barcelona Way” that is seasoned with such love and passion. The chef wears his heart on his sleeve. Aside from a menu full of excellent food, it’s the unique atmosphere that stands out most – one that is warm, inviting, and that will make all visitors feel immediately at home. Repeat visits are inevitable. Jamón Ibérico de bellota; “Bombas” croquettas; beef and foie gras carpaccio with truffle dressing; roasted meat canelón; cheesecake. Noise Level: Buzzy without being obnoxious. Service: Some of the warmest, most welcoming, and gracious service you will encounter. Each dish arrives with a smile and friendly hand on the shoulder. We went three different times – twice to enjoy a meal alone, and once with a group – and on no occasion did we ever feel anything other than welcomed, relaxed, and happy to be there. Timothy DePeugh is a contributor to Lifestyle Asia Singapore. By day, he’s a crusader for the underdog in the corporate world, and at night, he travels around Singapore in search of the best nasi lemak. When he’s not lifting weights or playing with his cat, he writes about restaurants all over Asia. Follow him on instagram at @timtimtokyo.